﻿ 107. H. Wood to Col. Green, [ALS], relative to Indian attack on civilians at Ricor (?) Landing. 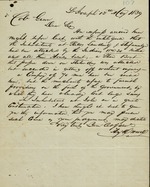 May 12, 1839. 1p. 107. H. Wood to Col. Green, [ALS], relative to Indian attack on civilians at Ricor (?) Landing. May 12, 1839. 1p. 107. H. Wood to Col. Green, ALS, relative to Indian attack on civilians at Ricor (?) Landing. May 12, 1839. 1p.